I am absolutely delighted to find myself back in France, launching the NEW Morphologi 4 platform at Forum Labo, Lyon. It is the first opportunity I have had to see the instrument at an exhibition since its launch in February. 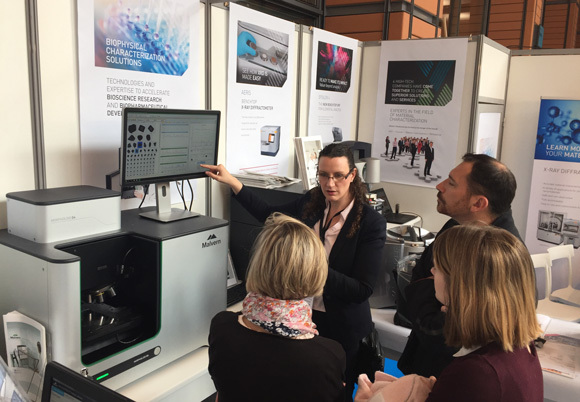 The exhibition is a highlight of the year for anyone working in laboratories so it is an ideal stage for us to demonstrate how the Morphologi 4 platform complements other laboratory equipment. Morphological imaging and Morphologically-Directed Raman Spectroscopy MDRS® techniques are fast becoming an essential part of the particle characterization toolkit, offering automated and rapid component-specific characterization to enable a deeper understanding of particulate samples. Here you can see me presenting the instrument at the exhibition. It is a pleasure for me to spend time with our current and potential customers and to find out what they think of the new Morphologi range. People seem to really love the award-winning compact design, and appreciate the full enclosure which protects the sample during measurement. 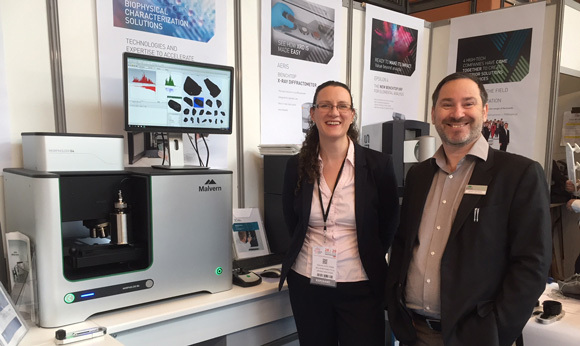 They are especially impressed with how we have now fully integrated the Raman spectrometer, minimizing the valuable space required in the laboratory. As well as talking about typical pharmaceutical powders and suspensions, we have spoken to people who require particle characterization for a broad range of reasons including understanding the performance of makeup products, identifying the source of pollen in honey, characterizing fibers, monitoring air quality, investigating process problems during cement manufacture, and characterizing bacteria. This visit has also been a great opportunity for me to meet with some members of our French team and, in particular, to spend time with our Imaging specialist here in France, Laurent Lachmanski. Laurent has been working with our imaging systems since the days of the PVS830, so has been part of our imaging evolution at Malvern Panalytical. He has been using the Morphologi 4 for a few weeks and is really impressed with the extended range and improved definition and especially with how quick and easy it is now to set up a method using Sharp Edge, the automated particle separation feature. Here you can see Laurent and myself in front of the Morphologi 4. The new Morphologi 4 range: Design matters! Ready for the launch of the new Morphologi 4 range on Valentine’s Day! Stay up to date with all the latest news, launches, updates, webinars and events in your area. Sign up to receive emails from Malvern Panalytical.